This year I wanted to pick somewhere I'd never been to for my birthday dinner and I've been passing Carnivale's West Loop sign on the expressway for years wondering what it was all about. 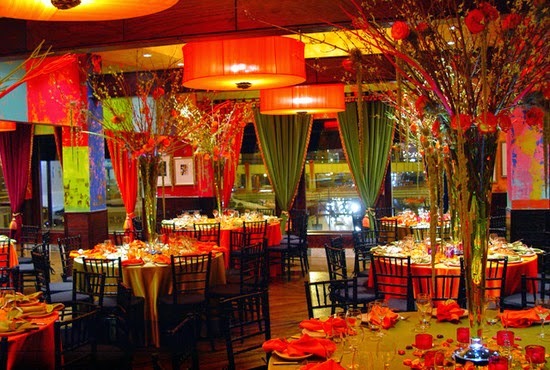 Chicago's Carnivale Restaurant is Latin infusion from the Coconut Mojito to the Carnivale Ice Cream Cake! 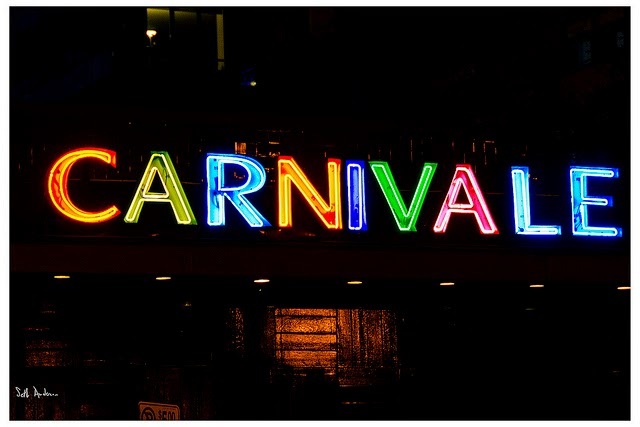 Located at 702 West Fulton, Chicago, IL 60661, CARNIVALE has a festive, vibrant, and happening atmosphere. The lavish interior glows red and runs the gambit from a large vaulted dining space to alcoved areas with booths and small tables for more intimate dining. The bar overlooks the expressway and is fashionably decorated with leopard print tufts and French hooded canopy chairs which is both funky and fun. Here's my daughter in one of the fabulous chairs! My husband and I started with Sangria and my girls had a virgin Coconut Mojito and Pina Colada. For appetizers we had the Oxtail Empanadas & the Octupus a la Plancha which had papas bravas. The papas bravas which is similar to a potato pancake but in a thicker form and deep friend, were to die for. 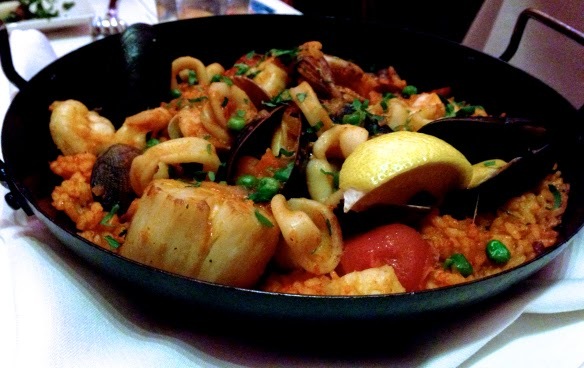 For dinner I had the Paella which had so much seafood I could only eat about half of the serving and the bomba rice was seasoned to perfection. My husband had the Churrasco steak & caramelized sweet plantains. The girls shared the Creek Stone Farm Prime New York Strip, which was built with two in mind. At this point we were stuffed but with all the fabulous desserts parading by and an acute desire to have something to stick the Happy Birthday candle in we trudged ahead, ordering the Banana Cream Pie and the Carnivale Ice Cream Cake with vanilla bean, guava and pistachio ice cream. Wow! 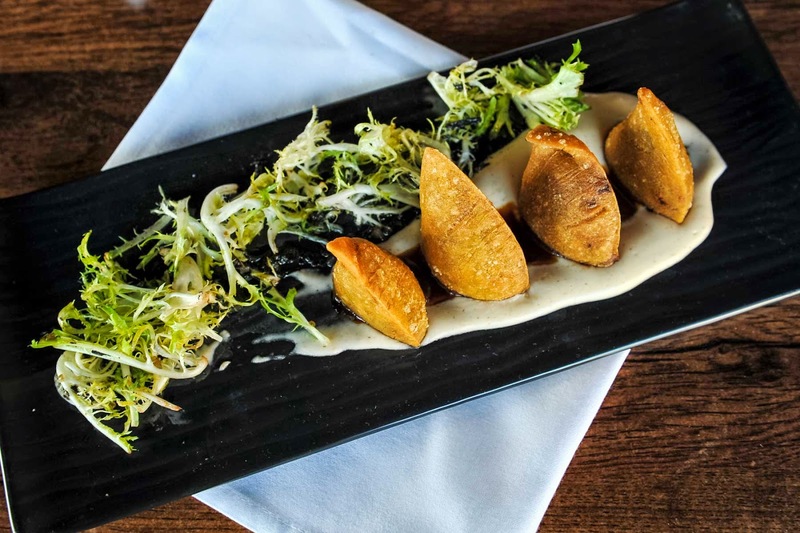 Carnivale is certainly a carnival of flavors for your palate and we'll be back again soon.